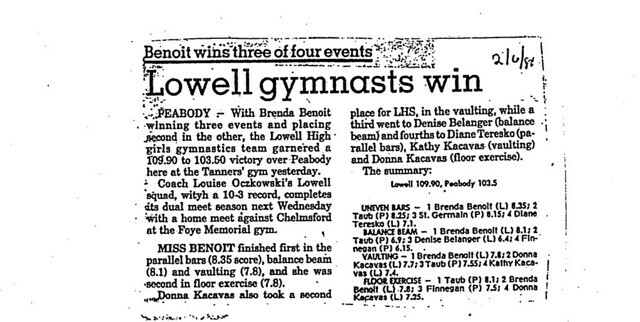 Combining natural talent, agility, grace, and athleticism, Brenda Benoit Coady developed into perhaps the most accomplished performer in the history of the Lowell High School gymnastics program. 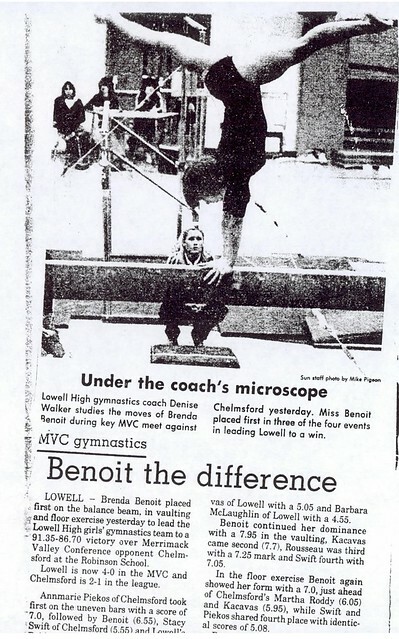 Competing in a sport that usually demanded full time year-round involvement. 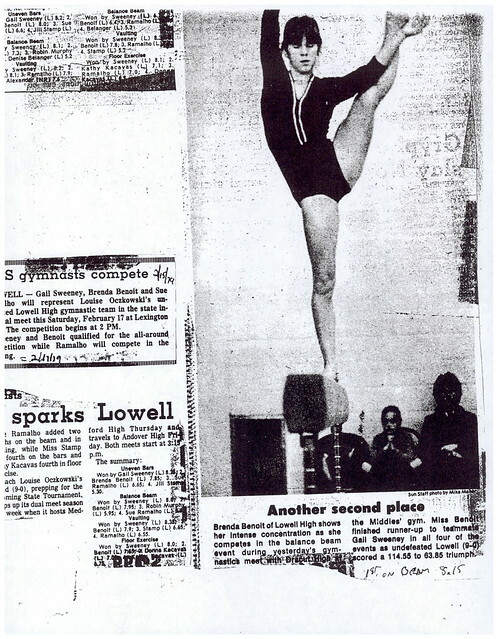 Brenda was a two-and sometimes three­season athlete at Lowell High, making her success as a gymnast competing primarily against full time “club gymnasts” all the more remarkable. 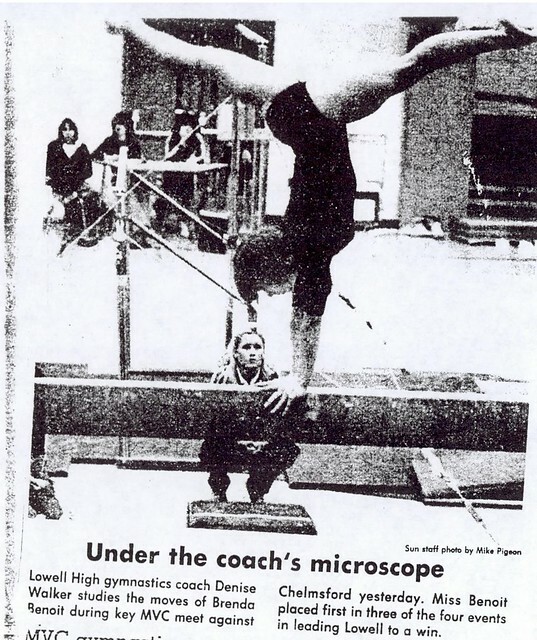 A four-year varsity performer, Brenda was a regular place winner in dual meets and competed at the Massachusetts State Individual Championships as a freshman in the uneven bars and vaulting. 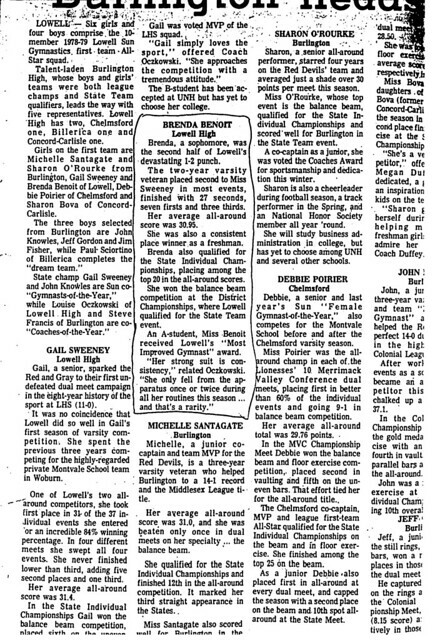 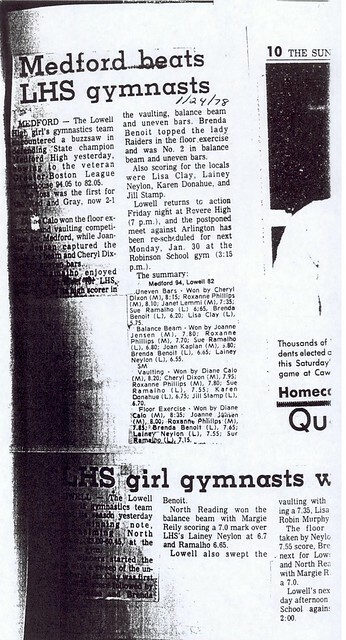 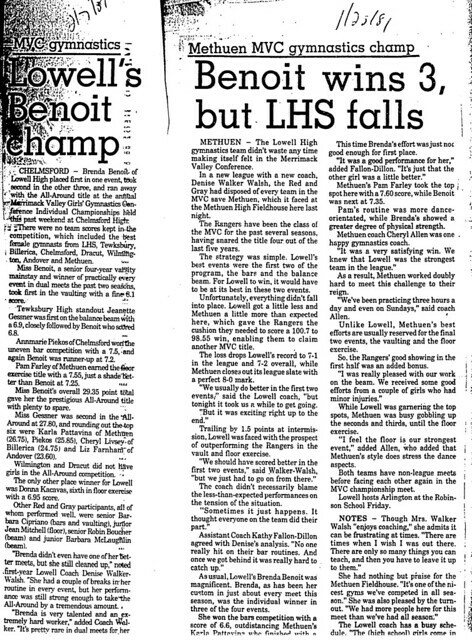 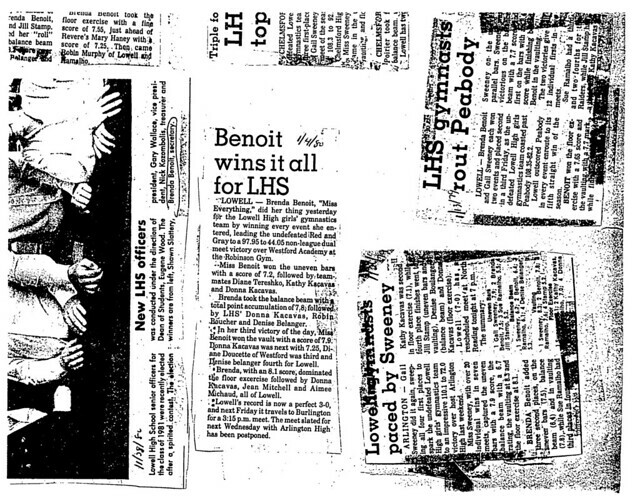 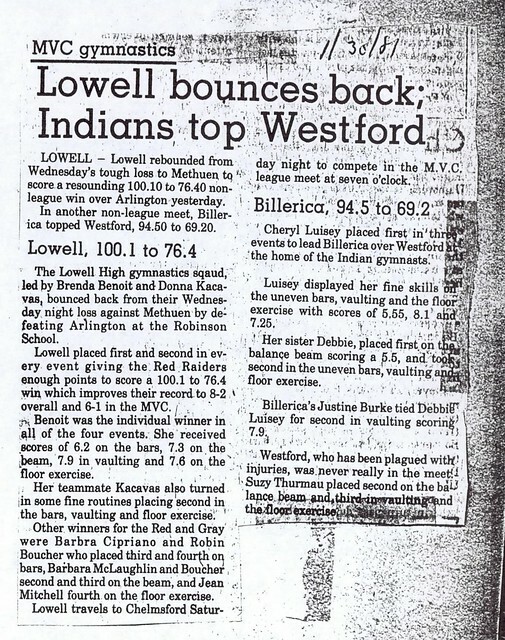 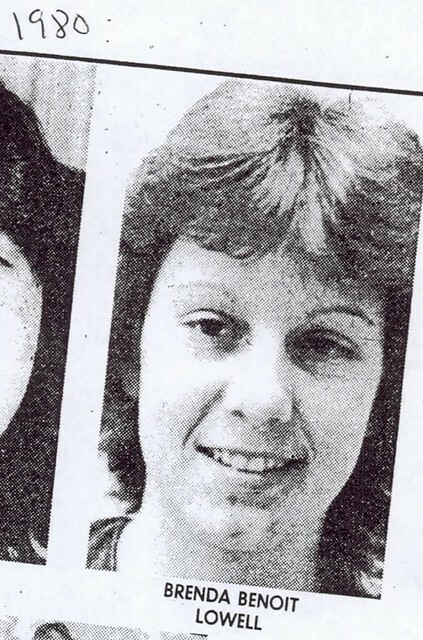 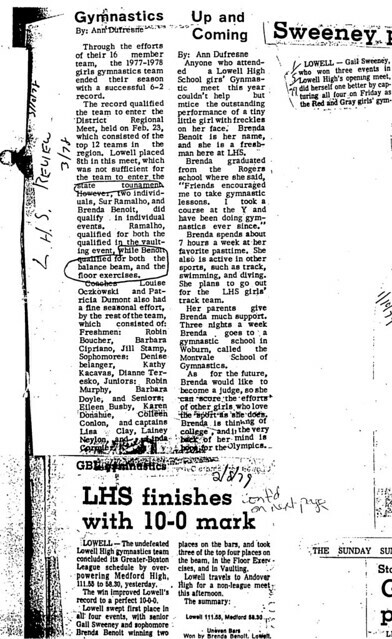 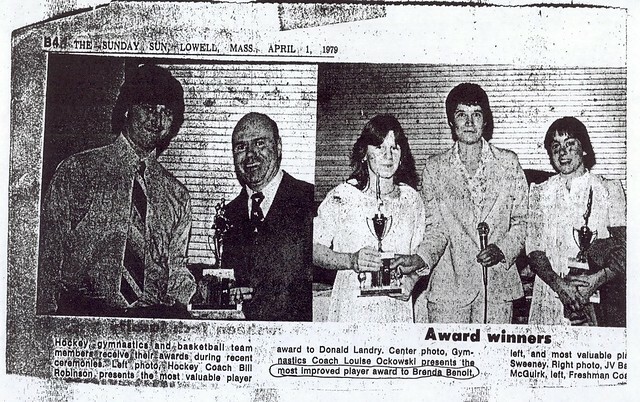 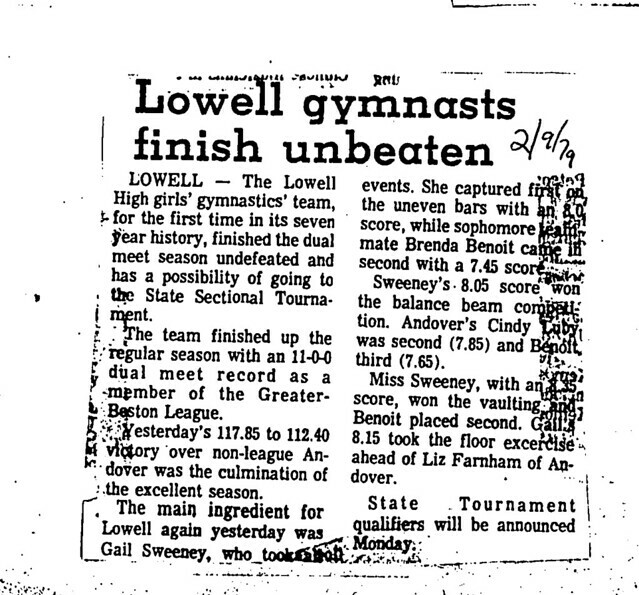 During her sophomore season (1979–1980) Brenda was an important part of perhaps Lowell’s most successful squad ever, compiling 7 firsts, 27 seconds and 3 thirds in dual meets as the Red and Gray compiled a perfect 10–0 records. 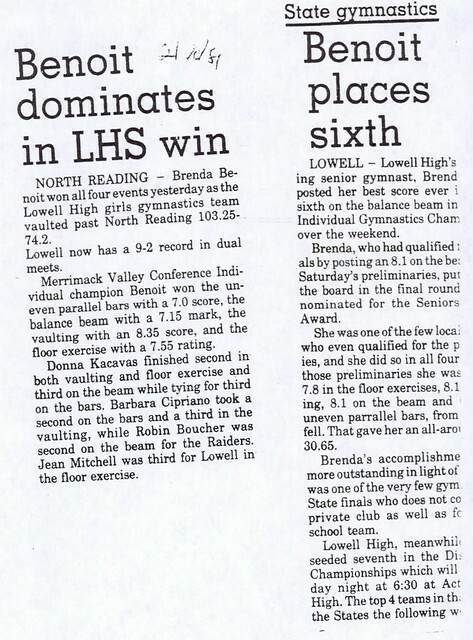 Brenda won the balance beam competition at the District Championships, helping Lowell qualify for the State Team Championships for the first time in school history (7th place finish). 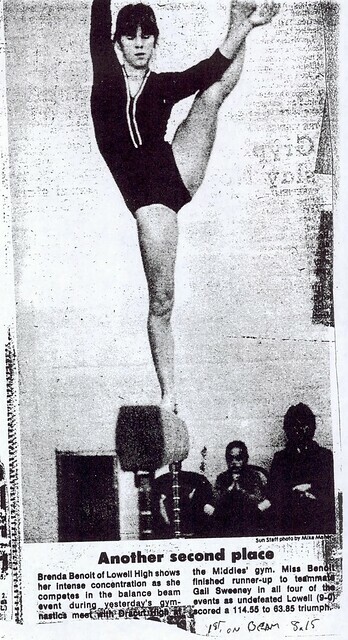 Brenda placed among the top 20 scorers at the Team Championships. 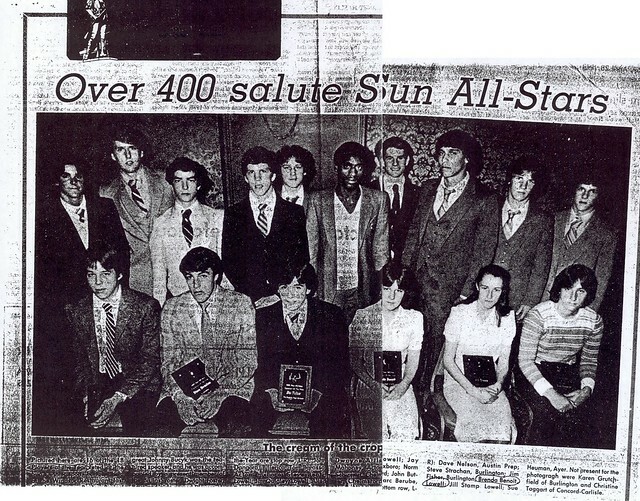 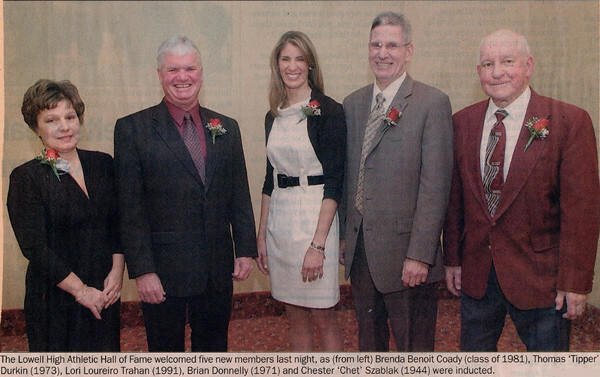 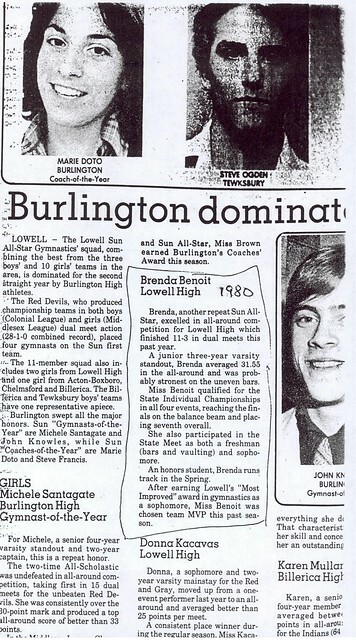 Brenda was selected as a Lowell Sun All-Star for her efforts. 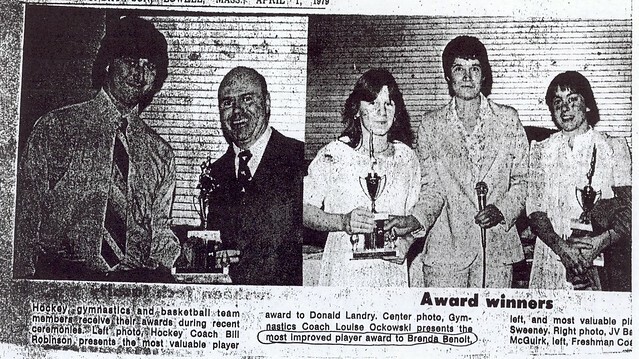 She was selected the team’s Most Improved Performer. 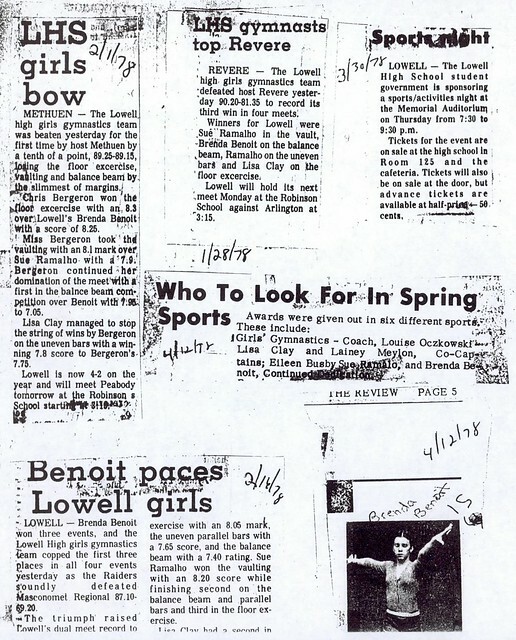 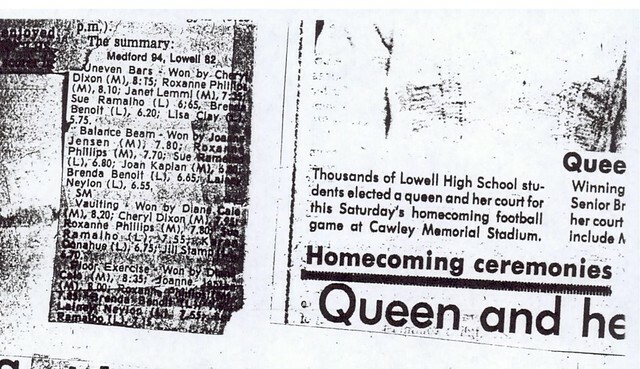 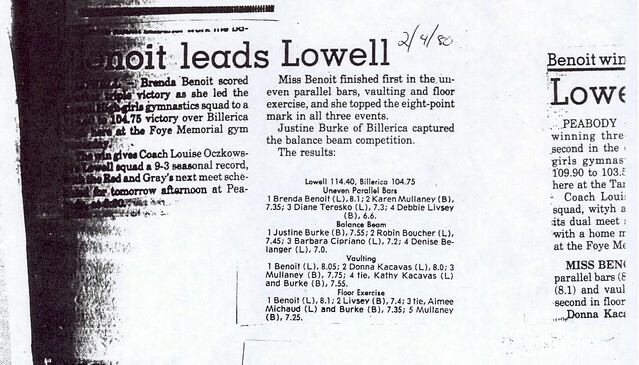 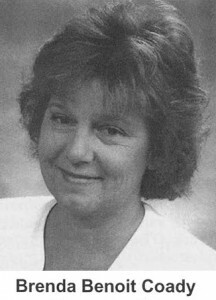 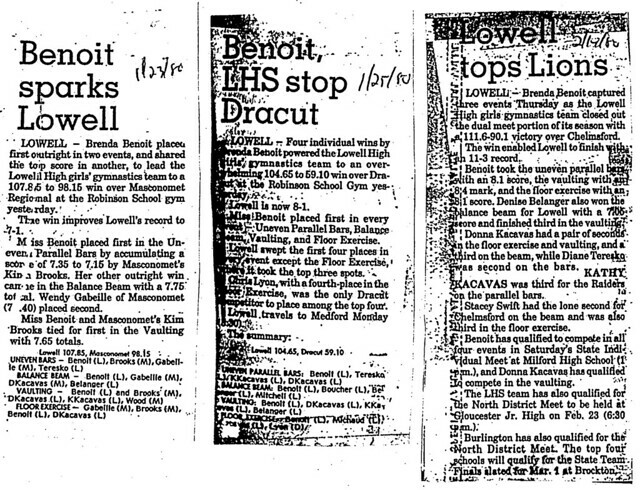 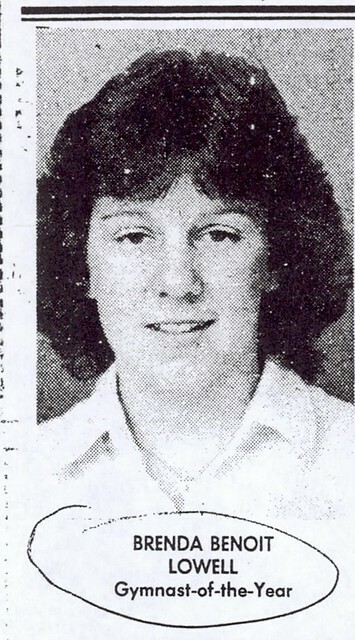 As a junior (1979–1980) Brenda led Lowell to a dual meet record of 11–3, regularly winning 3–4 events in the process. 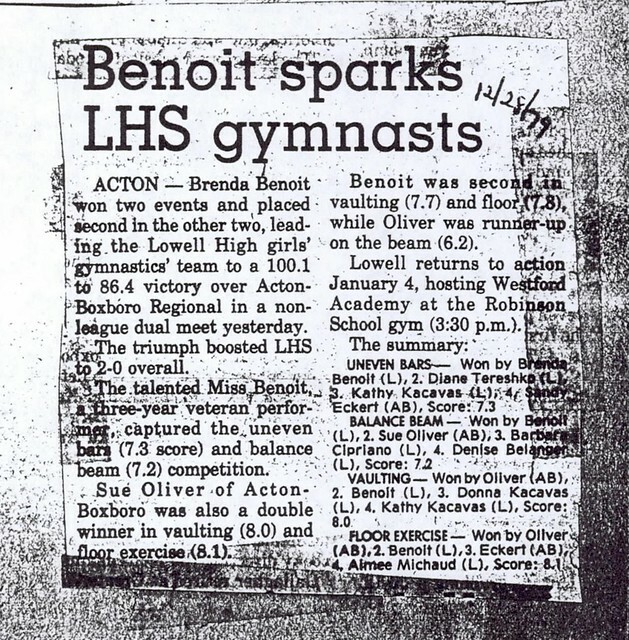 In the post season, Brenda again excelled, qualifying for the State Individual Championships in all four events–uneven bars, balance beam, vaulting, and floor exercise, and placing 7th in the balance beam. 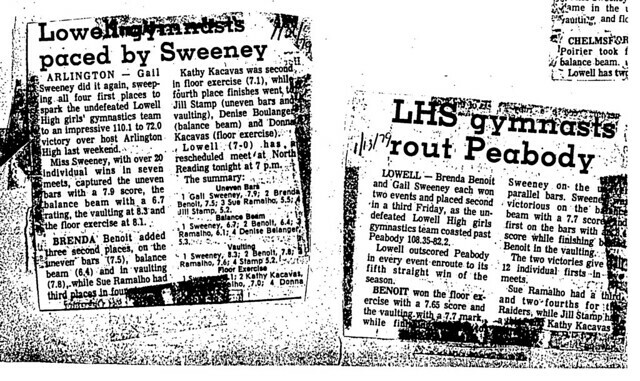 She was again named to the Lowell Sun All-Star team and was Lowell’s Most Valuable Player. 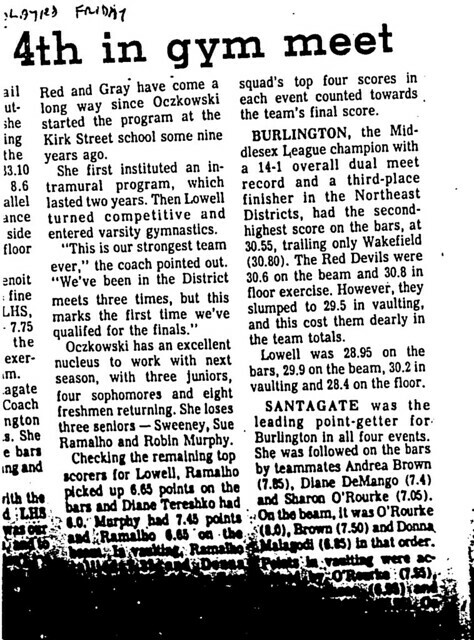 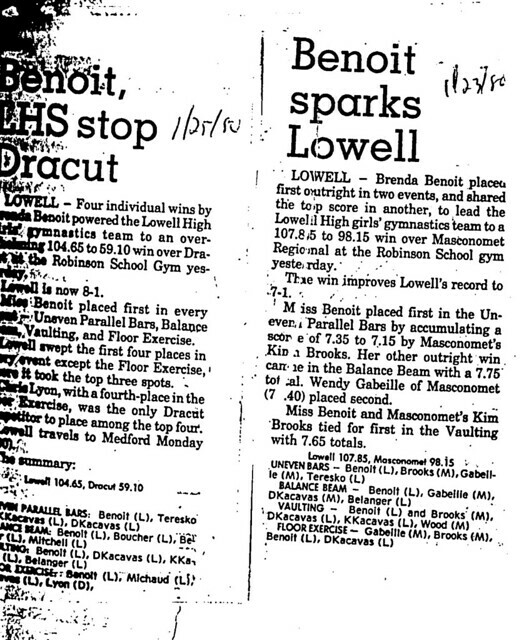 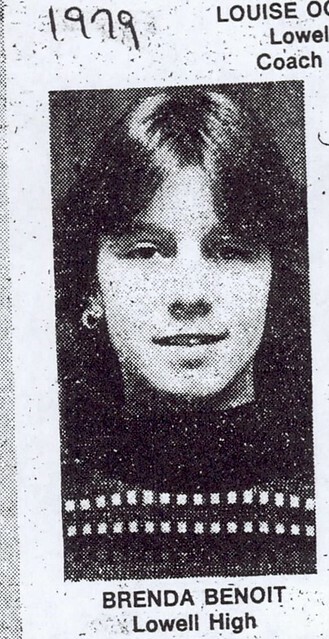 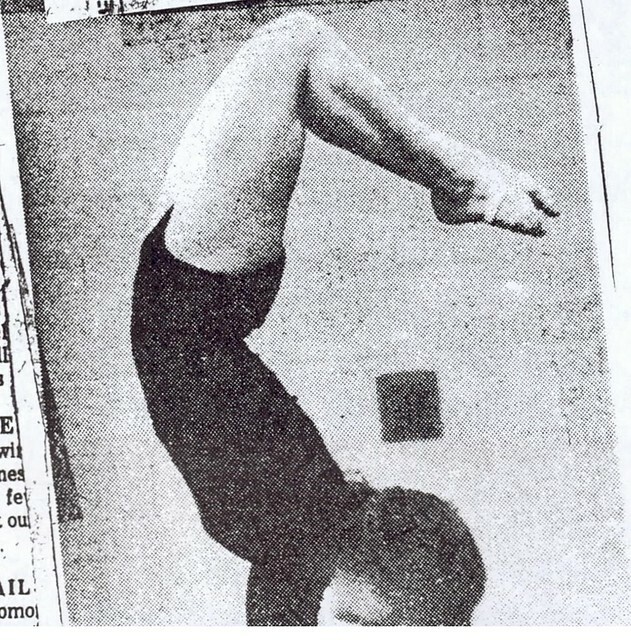 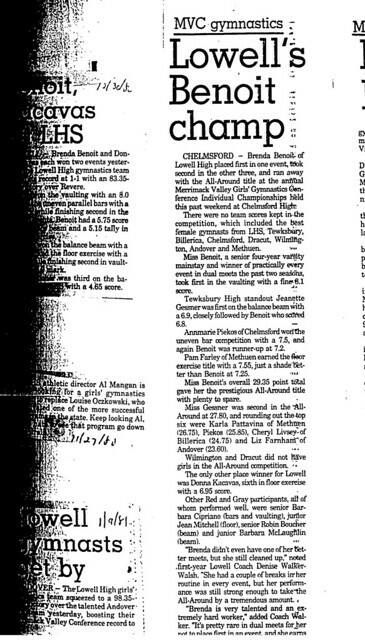 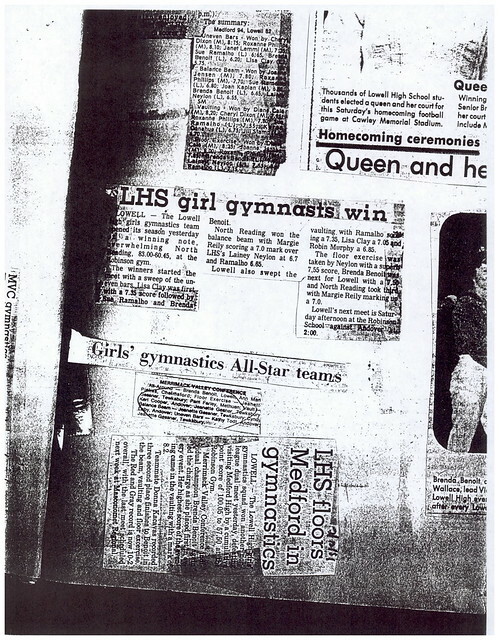 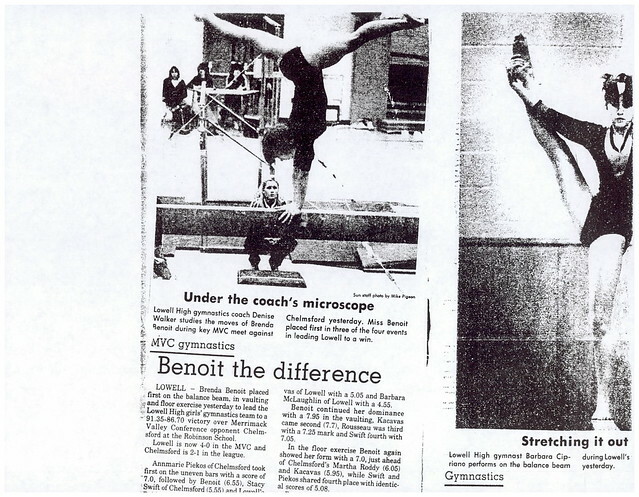 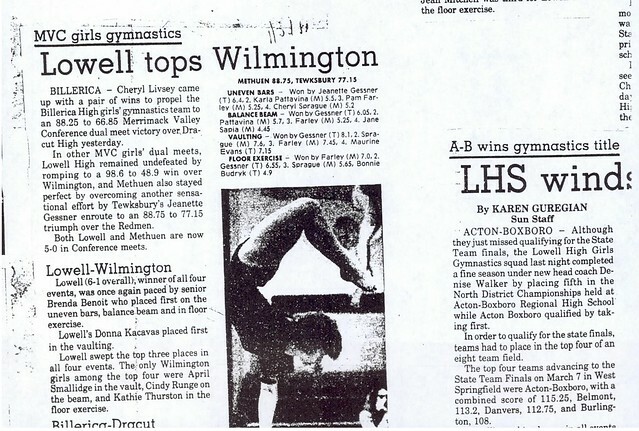 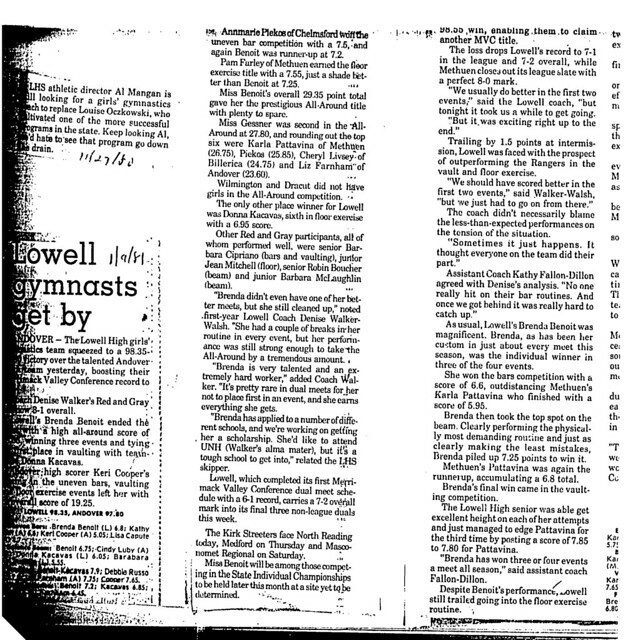 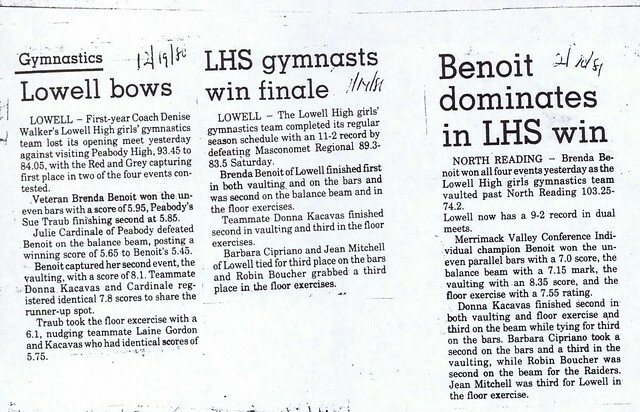 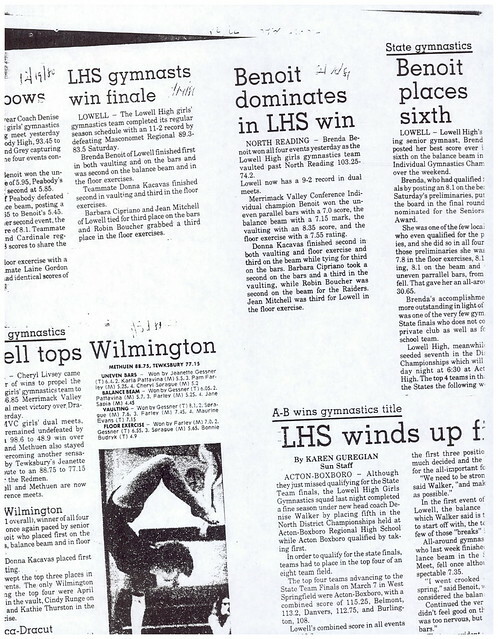 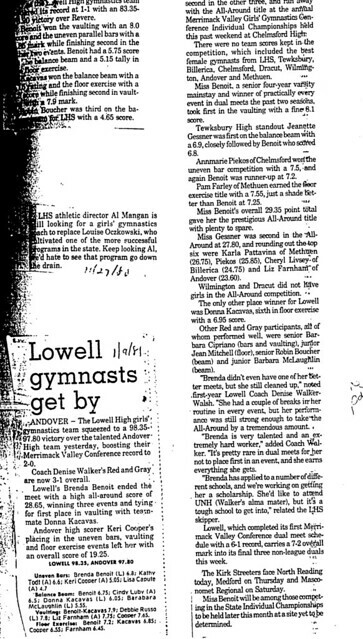 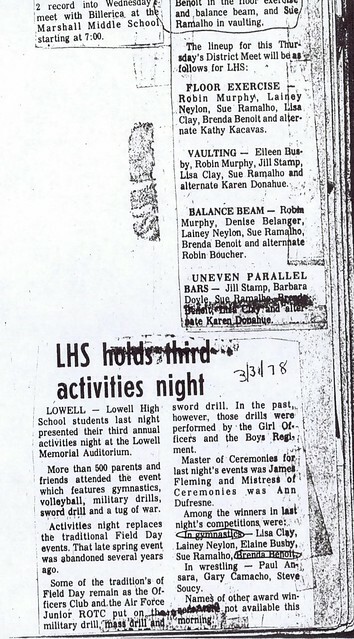 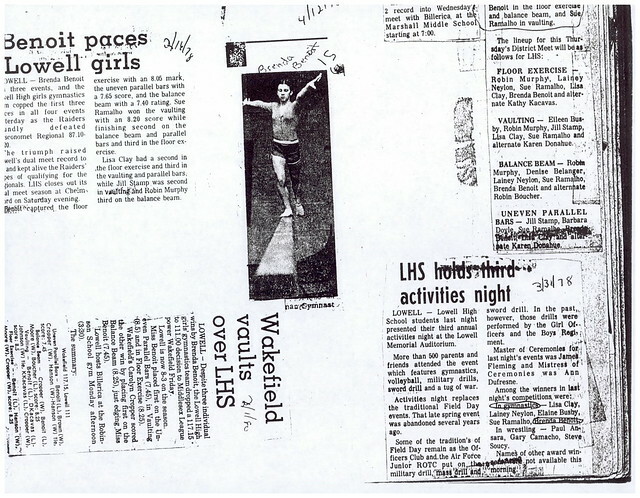 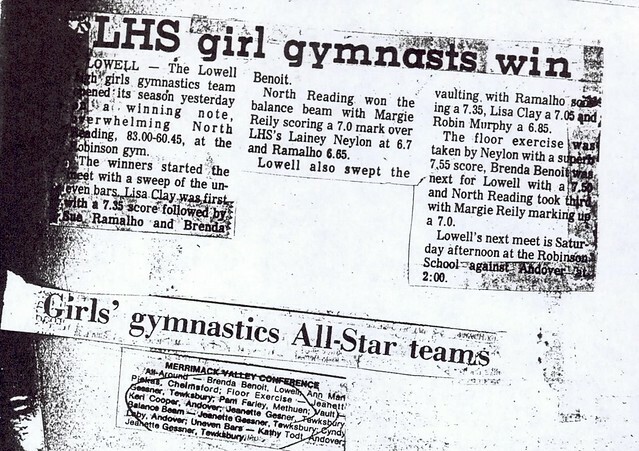 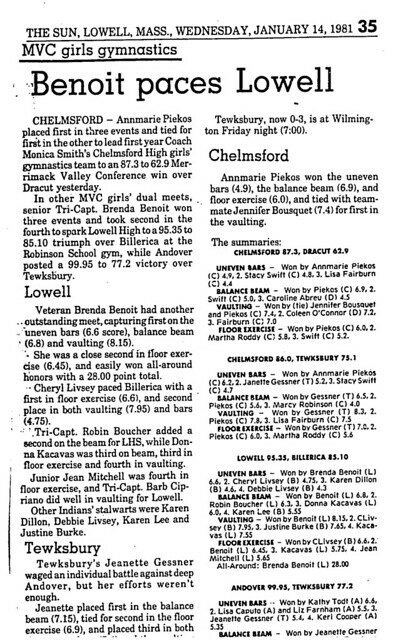 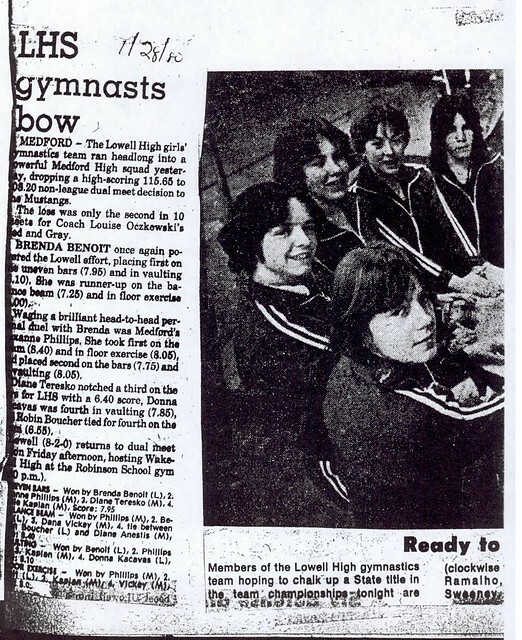 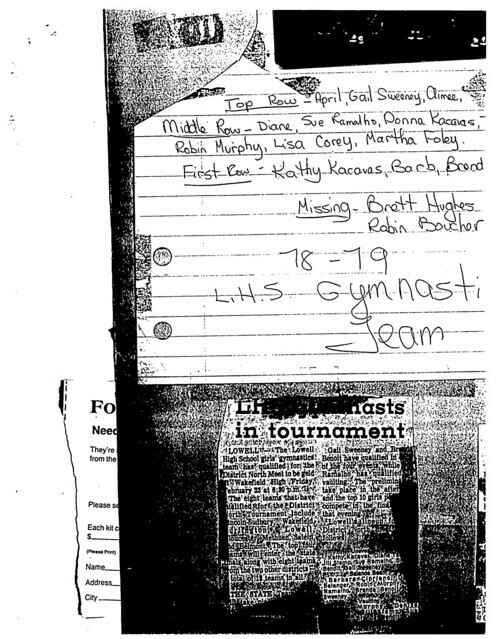 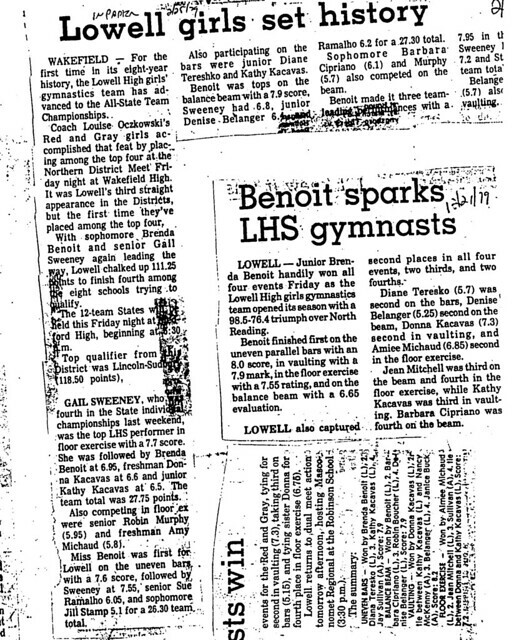 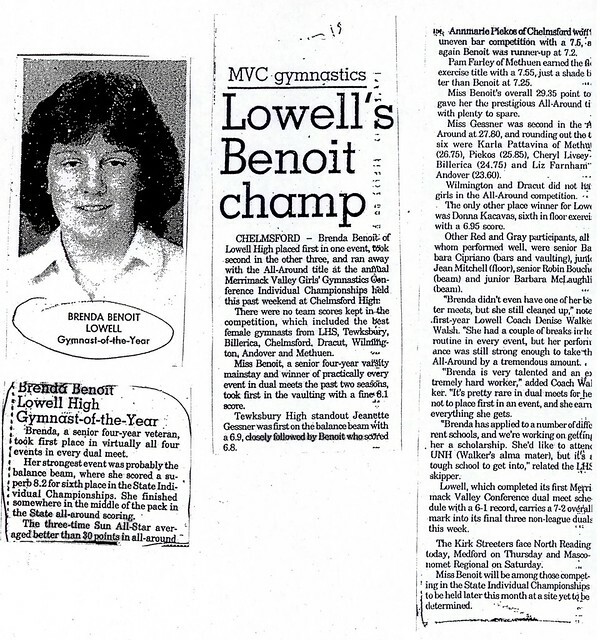 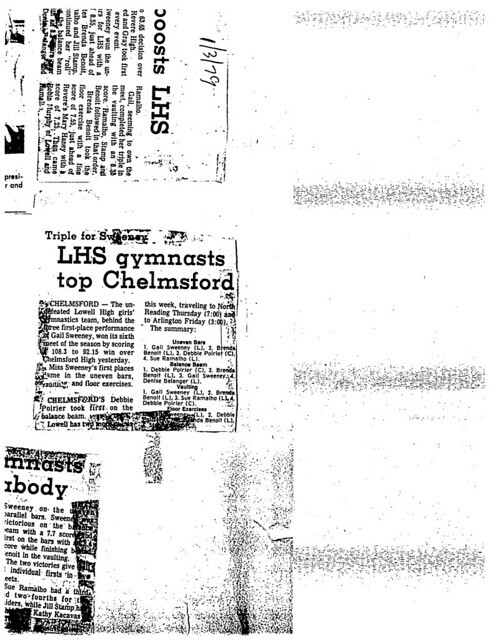 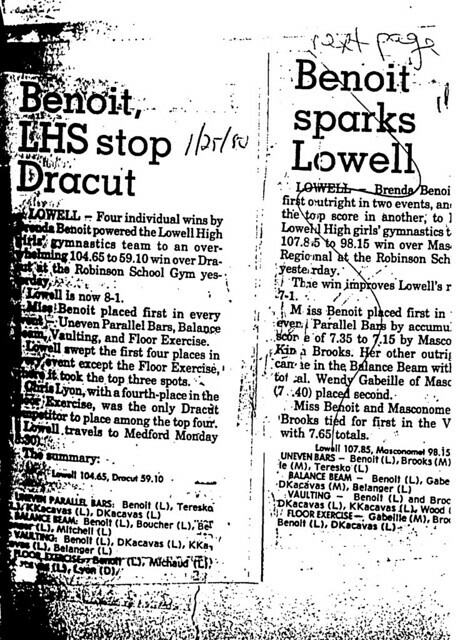 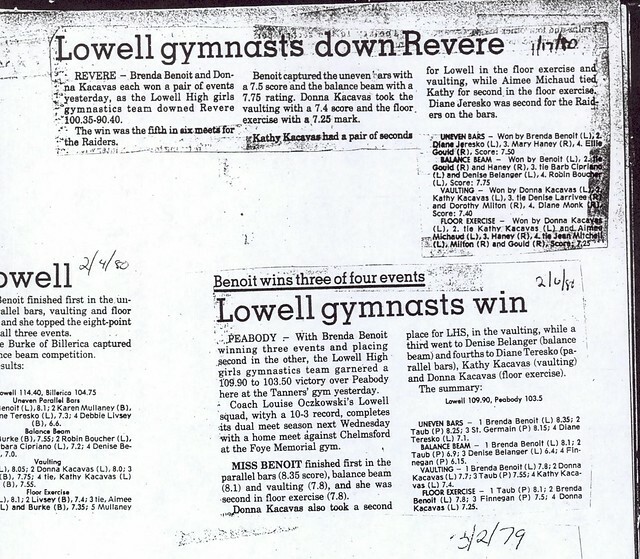 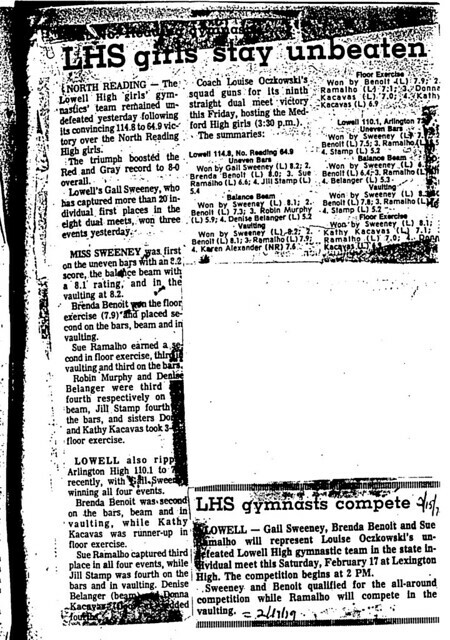 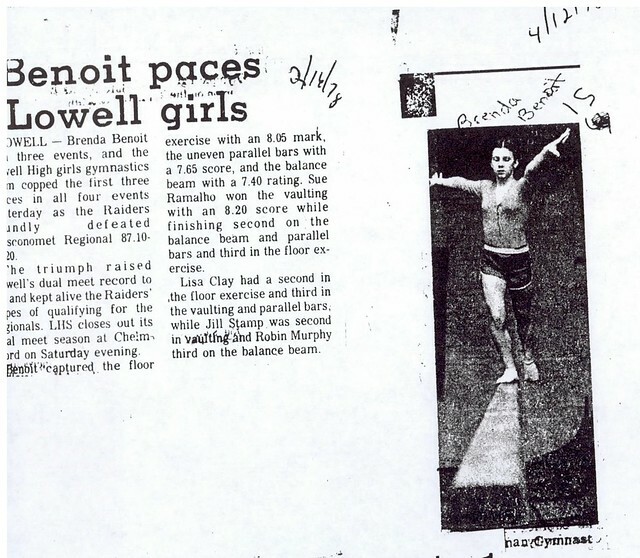 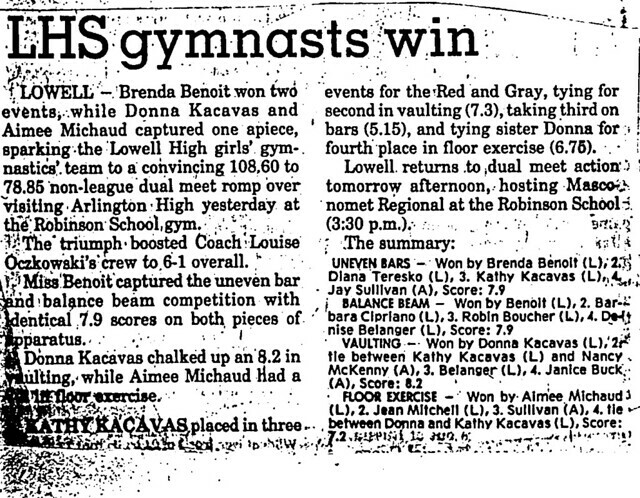 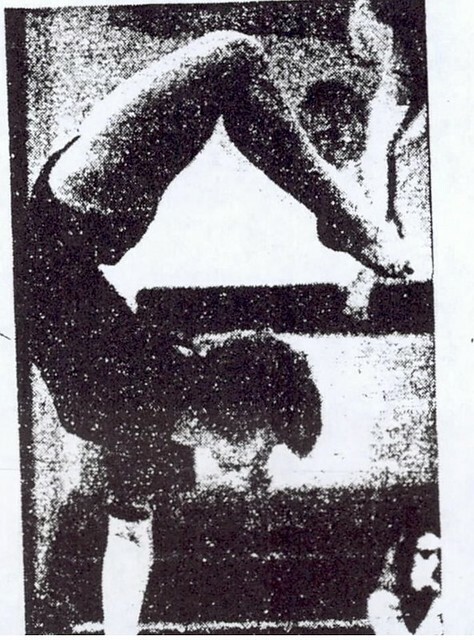 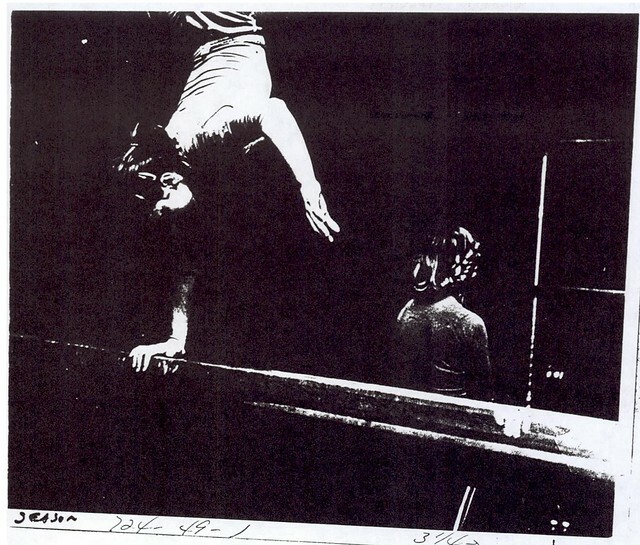 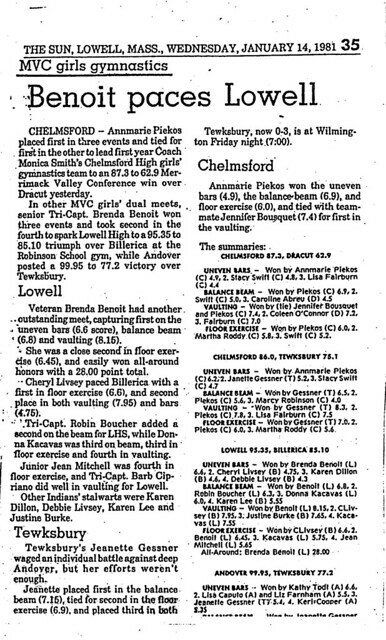 As a senior (1980–81) Brenda was the dominant gymnast in the highly competitive Merrimack Valley Conference, leading Lowell to a dual meet record of 11–2 and placing 1st in all four events in virtually every meet. 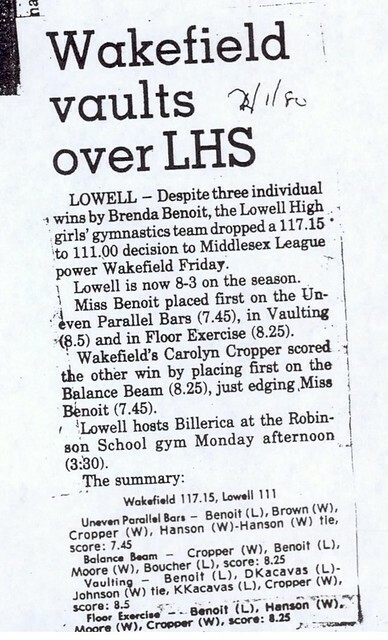 The highlight of Brenda’s season might have been at the Merrimack Valley Championships where she placed 1st in vaulting and 2nd in the other three events to easily win the coveted All-Around Championship. 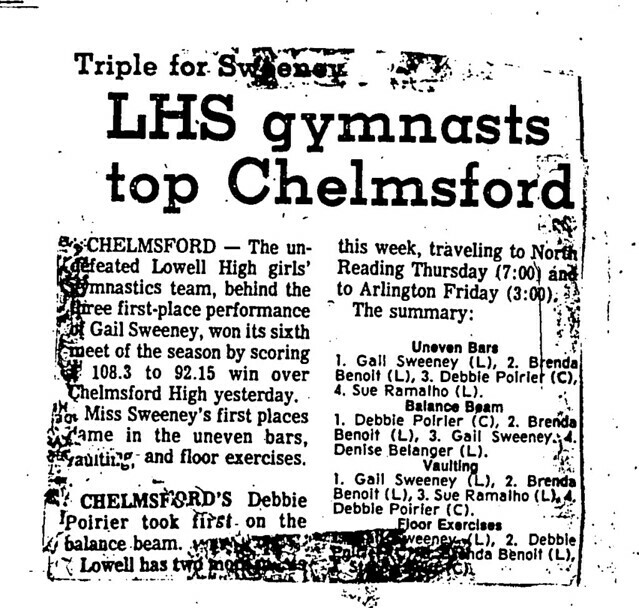 Competing again at the State Individual Championships, Brenda placed 6th in the balance beam. 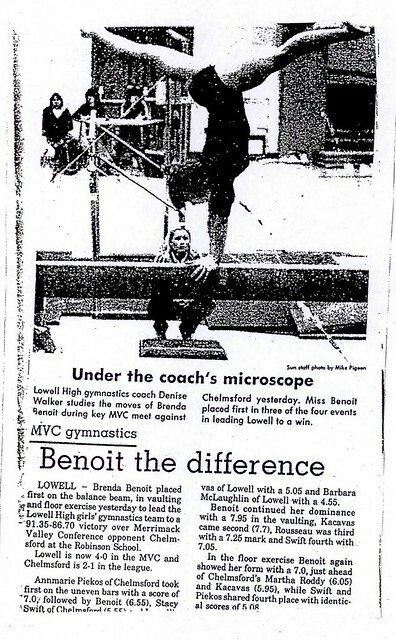 Coach Denise Walker praised Brenda as “…very talented and an extremely hard worker.” Brenda won Lowell’s Outstanding Senior Gymnast Award and was named the Lowell Sun’s Gymnast of the Year. 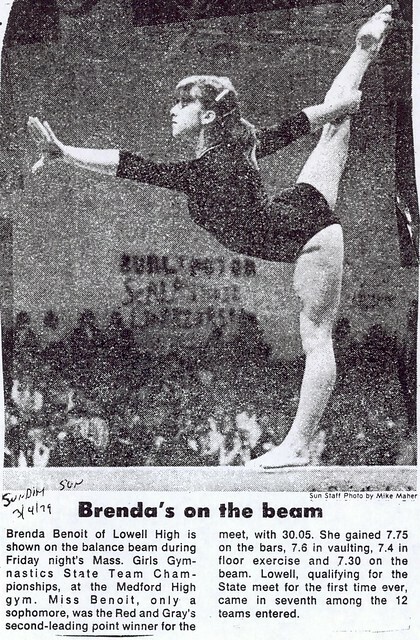 In addition to her stellar career as a gymnast, Brenda found the time to be an outstanding long jumper/sprinter for the outdoor track team (1980–81) and even ran a season of cross country (1980).